My bestie recently gave birth to her 3rd beautiful bub. She’s a clever one! As mumma to a 3-year-old and 5-year-old, I thought she might appreciate having something on hand to thrust at the older kidlets when she needed to buy herself some time. a) Pattern sticks. A bunch of pipe cleaners and some beads for threading. Kiddies are instructed to explore the kinds of patterns they can make. There is something about beads and threading that just calms kids right down. Amiright? For the 5 year-old, I also included a bracelet beading pack (smaller beads for more dexterous hands). b) Step-by-Step drawing sheets. Many moons ago, a teaching buddy gave me a whole heap of photocopied how-to-draw-various-animal-sheets. My bad, I don’t have the name of the text- but you can buy similar how-to books at the Post Office or the book stalls that spring up in the middle of shopping centres. c) Colour matching activity. Simple stuff- match the “gems” to the corresponding (or nearest) colour on the colour wheel. Acts as a great language activity if you ask children to describe the colour of each gem as they go along. d) Cheapish activity books. Companies like Scholastic have great stock take sales throughout the year. Keep your eyes open. I stocked up on colouring and sticker books and picked up copies of this great marble book, complete with a set of marbles and instructions for many marble games. e) Sticker shapes. At a Professional Development workshop led by an Occupational Therapist, I learned that peeling stickers off their sheets is a great strengthening activity for little fingers. (And we need strong fingers for that old-fashioned thing called writing!) This activity contains sheets with shapes from Microsoft Word (I know…. so designer-y) and a sticker booklet. The idea is to peel the stickers off and follow the outline of the shape. f) Literacy activities. These were just initial sound games printed off and laminated from Teach This. I also love using K-3 Teacher Resources. Both sites require a paid membership (which is well worth it.) If you’re after some free Literacy activities that you can DIY, check out my Literacy Board on Pinterest. If you’re after some Numeracy activities, check these ideas out. I packaged each activity in a ziplock bag (most teachers have a love affair with ziplock bags and their organisational abilities!) with instructions. The idea was for each activity to be low-fuss, mostly independent and quick to pack up. What activities keep your kids busy? Linking up with Essentially Jess for I Blog on Tuesdays. I just sat down with my 11mth old after setting my nearly 3 yr old up with some busy bag activities (tongs, pom poms and plastic tubs). 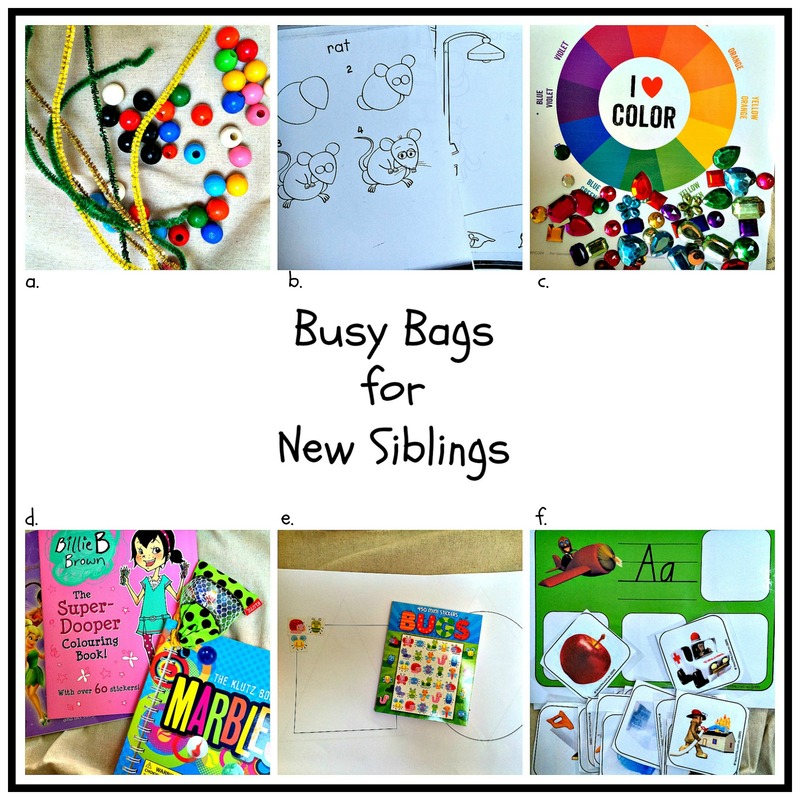 I got these busy bag ideas from a teacher friend of mine, before my youngest was born. Perfect for rainy days and so useful. I keep them in zip loc bags too and they are so handy. Great ideas here too! Am definitely pinning this so I can keep tabs on the resources you suggest too. Great minds! Tongs are a great implement. Pom Poms are a bit dicey for my 18 month-old- they ALWAYS end up in her mouth. Gah! I’ve seen these everywhere! They would also make a great idea for siblings when you take older kids to school. I like to help with reading and things, but it’s good to keep the little ones occupied. I am just discovering busy bags and I think I am in love! So many varieties too.